← The Election is Over and I Won! An LRT ground level street intersection crossing. Emirates. 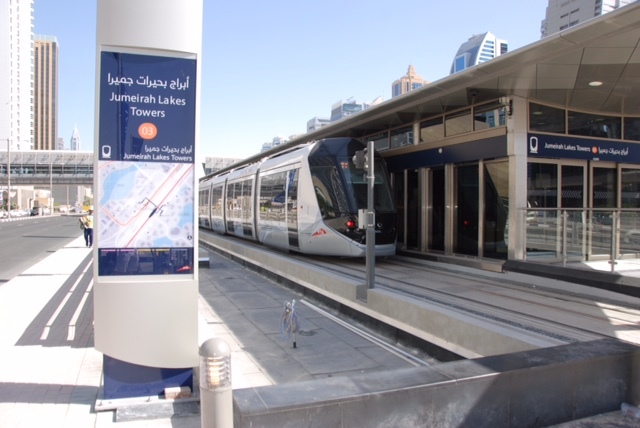 Yet another form of transit by RTE in this rapidly growing Gulf city of 2.1 million people, the Dubai Tram connects Marina City, Jumeriah Beach, Internet City, and Dubai Media City to the Dubai Metro – a subway like train that actually travels above this vast city on raised tracks rather than underground.The Light Rail Transit travels as well on raised tracks alongside the massive Sheik Zayed Road/Expressway as welll as in dedicated track lanes at ground level on city roads too. It is an interesting combination of systems. Really good signage being used by the system with great area maps, named, numbered and colour coded stations. The LRT has been under construction for four years and will open this Tuesday, November 11th with the first day of operations reserved solely for the Sheik and Royal Family, it will then open to the broader public on Wednesday, November 12th. I was lucky to get a chance to explore much of the system over the past few days and despite thousands of workers racing around the clock to complete it, the system is impressive and it was fun to watch them testing everything out as well as learn how to drive the trains as they ran the system empty of people. The cement pyramids used at road way edges to prevent cars from driving onto the LRT tracks.No overhead wires – instead a ground level power system clearly visible in-between the rails here on this road crossing. The system is quite unique for a few different reasons. First it is the only LRT system in the world with every station enclosed and using automated platform doors. This is simply a fact of the intense desert environment here and summer temperatures reaching 45C+. People would die on the platforms in the heat of the sun if there wasn’t air conditioning and climate control. 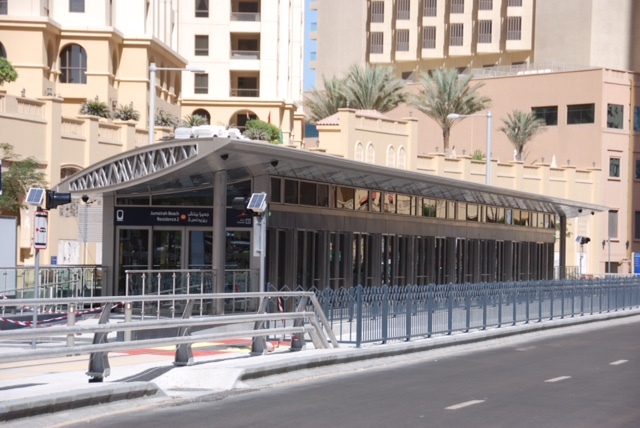 The current metro system has an impressive and very extensive system of air-conditioned stations and totally enclosed air-conditioned walkways to reach them. It is good inspiration for us to consider at least making some of our busier stations more protected from the Canadian weather and elements. The inside of one of the new Dubai LRT stations – the only all enclosed station system. Secondly, similar to Bordeaux, France the LRT system has no overhead catenary wiring but instead uses an innovative ground level power supply – a buried third rail system that switches on power to each section of rail as the LRT passes over it. 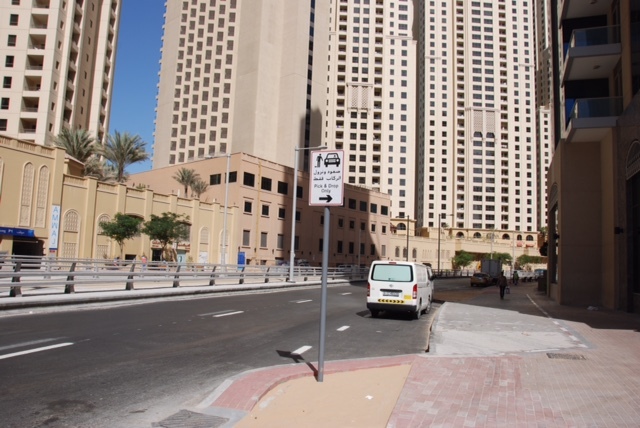 Thirdly, the LRTs have a Gold (first class section) as well as Silver (second class section) as well as space dedicated to women and children (more than 75% of the population of Dubai is male). Although Phase 1 is only 11.5km long with 13 stations, Phase 2 is already under construction and there are plans for additional phases as well as the emirate races to provided the needed infrastructure in this rapidly growing region. The pace of construction here is hard to fathom with most work sites throughout the region operating 24 hours a day, seven days a week with astonishing numbers of workers on every building site.The Dubai LRT is using the popular Alstrom Citadis LRV’s that will accommodate upto 300 people and if the nearby metro that the LRT links to at several stations is any indication, there should be plenty of ridership from the skyscrapers, hotels, beaches, and luxury marinas that already line much of the LRT route. A small little roadside passenger drop off/pick up area with the station just behind me to my left. This is a great idea that we need to consider in Waterloo. challenges adapting to the rail crossings and there have been several car/train collisions already. It turns out in this often extremely congested city, drivers unfamiliar with rail transit were trying to take shortcuts down LRT rights of way. 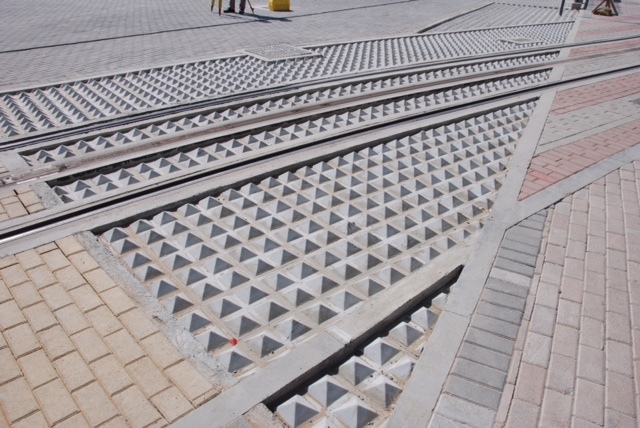 Thus, interesting cement pyramid pavers have been used to discourage car traffic and steep 20,000 AED ($6,500 CAD) fines have been implemented for driving on the rights of way or not yielding to LRTs at crossings. You will see photos below of the extensive multilingual road signage below trying to teach drivers how to deal with LRT’s at intersections. Their system will use the same very successful NOL card system as their metro, buses, ferries, abras, trolleys, and other forms of public transportation – a loadable card that is scanned on every boarding and exit at the entrances to the stations platforms. With prices starting as low as 85 cents Canadian it will certainly be an affordable system for riders. It will be an exciting week as they prepare for the opening. Every station is a buzz of activity with hundreds if not thousands of workers at each still making finishing touches and cleaning off the desert dust. In a brilliant move huge searchlights and generators have been brought into each station area that will sweep the sky at night clearly showing locals where each station is located and creating some Hollywood-like opening excitement this week.All the signage for the system is bilingual – Arabic and English with lots of icons as well to accommodate the incredibly diverse multicultural mosaic here. Interestingly, the LED signs on each Light Rail Vehicle have had to be programmed to scroll the English station names and other messages from right to left, but then reverse and scroll the Arabic from left to right since it is read in the opposite direction. 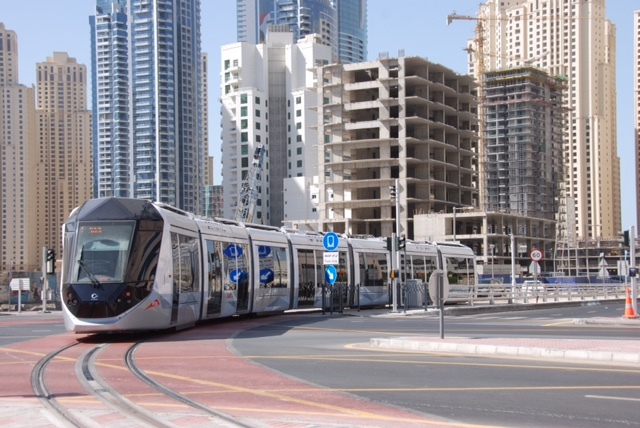 Unfortunately I have to depart and won’t be here later this week for the grand opening of the LRT however, it will be interesting to see what becomes of the tram here as Dubai ramps up for Expo 2020 and the economy here is booming again after the 2008 financial crisis. 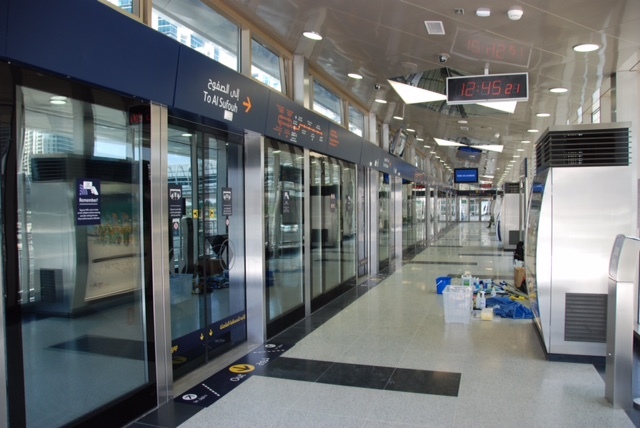 A typical Dubai LRT station – the only system with totally enclosed stations and automatic sliding entry doors. getting around a fascinating and beautiful part of this incredible city that is home to the world’s tallest building, the world’s largest airport, the world’s two largest shopping malls, the world’s largest fountain, the world’s largest fleet of jumbo jets (in particular more than 50 of the massive Airbus A380’s with 85 more on order for Emirates Airlines as fast as Airbus can build them), and a city that is home to hundreds of high-rise buildings over 20 stories – almost all built in recent years.There is lots to learn from Dubai for our design, construction and operation of the ION LRT system. Lets hope that ION will help to ensure that Waterloo is just as successful and helps to make us in our own way one of the greatest communities in the world to live in. This entry was posted in Uncategorized and tagged Dubai, Light Rail Transit, LRT, transit, United Arab Emirates. Bookmark the permalink.